At just 10 watts apiece, the meter tall side-mounting speakers feature a 1" diameter tweeter and two 3-1/2" diameter mid ranges behind a fabric dust grill. There is also a tiny little 1-1/4" diameter woofer on the rear of the speakers which gives them a little bit of Bass to liven up the sounds - for example when a big explosion occurs in a film. The sound quality of the two speakers is good, but not a replacement for a good home theatre audio set up if you want to take full advantage of what DVD's have to offer acoustically. 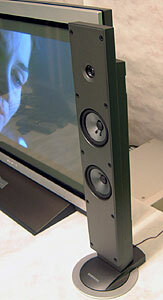 Each of the speakers are connected to the SPL4225 with really thin speaker wire that is not more than about two meters long - so if the speakers are detached and mounted on the optional floor stands, you will either need to place them close by, or replace the wire if you want more distance. The speakers are mounted directly to the plasma panel with the help of a nice metal bracket and some screws, and in that way wall mounting really does leave the table top absolutely free from any other objects. 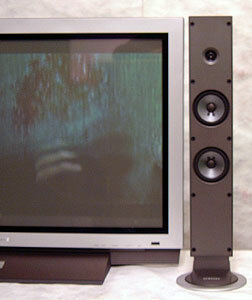 If you pony up the dough for the optional metal speaker stands, the two speakers can then be placed independently of the plasma display itself - again though, you will need to use longer wire in most cases. There are no integrated speakers within the plasma panel itself, so if you don't want to get the side mount speakers, you'll have to find other means of outputting the audio - either via a stereo system, or home theatre set up. The Samsung SPL4225's on screen menu system allows keen users a few sound control options including a few presets like; music, speech, movie, standard and even your own custom settings. The speakers are good for what they are, and I don't think the sound is bad by any means - it is certainly not as sweet as you would hear from a full set of decent stereo speakers. The beauty of them really is for environments where the plasma display hangs on a wall, or no stereo equipment is present. Audiophiles will undoubtedly want to bypass these satellite speakers and pump the audio directly from a separate DVD player, or HDTV tuner to the amp. Incidently, there are four audio inputs round back, but the only outputs are the wire connectors for the speakers themselves. 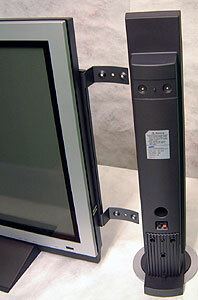 The death of beige components could not be a more welcome change - the speakers that come with the SPL4225 measure about 1m tall and come with really cool looking stands so they can be positioned away from the display if you wish. 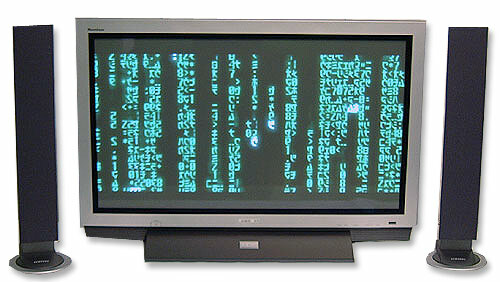 Each speaker connects to the main plasma display via a set of wires which also power the speakers. Sound quality is good, but if you want to get knocked back across the room with Bass, you'll have to look towards other solutions.